Michael G. Morris, CEO of American Electric Power. As the largest supplier of energy in the United States, and its biggest greenhouse gas emitter, utility giant American Electric Power has been influencing this new marketplace and what will emerge from Congress once comprehensive energy and climate legislation is passed. There is no environmental benefit whatsoever from a tax. None. I argue this every day with my colleagues in the business world -- the fellows from Exxon Mobile, Federal Express. Part of the current proposal includes a provision known as avoided deforestation, in which companies like AEP can invest in forests and earn emissions credits from keeping them standing and sequestering the carbon they contain. AEP has been at the forefront of financing such projects in the hopes of gaining emission credits from them once U.S. climate policy is written. Trees are widely considered to be the least expensive offset option, certainly far less costly than investing in cleaner energy solutions at home. But currently there is no level playing field. Avoided deforestation, for example, is not permitted as an offset in countries governed by the Kyoto Protocol, but it could become one of the most popular of the "low-hanging fruits" in the U.S. offset market. These divergences are likely to create multiple pricing structures for carbon credits, with the potential to set off a new global trade war. FRONTLINE/World put some of these issues to AEP's chief executive, Michael G. Morris, asking him about two controversial forest projects the company has financed in Bolivia and Brazil, and what kind of measures he and other energy-sector leaders are demanding of U.S. lawmakers to "keep the lights on" and remain "cost effective," as Morris puts it, in a era where carbon has a price. It's not an easy transition for AEP, which operates more than 50 coal-fired plants across the United States and is the largest consumer of coal in the Western Hemisphere. This is an edited transcript of an interview that took place in California in November 2009. Mark Schapiro: If you compare AEP to the giant German utility RWE, it appears that RWE [as a European company] it has its own emissions limits to contend with. So we could end up in a world market where the credits that are accessible to you via forest preservation projects are quite a bit cheaper than the credits available to RWE. Michael G. Morris: RWE, then, would find its answer inside its own requirements and flexibilities and recover those costs in the marketplace that it serves. RWE is a well-run German utility. In fact, most of the European utilities are no longer country-centric. They serve other major sectors of the European Union. We have been for the longest time the only representative of the E8, the country electric utilities of the G8 [Group of Eight Industrialized Nations]. RWE has been a partner of ours in a carbon capture and storage project we have in West Virginia; we've done an engineering data exchange with them over a number of years. They're very advanced engineers in Germany, as we all know, and I'd like to think that they've learned a lot from our people as well. "I don't think there's any question there'll be a WTO challenge here. One of the things that the [climate] bills in the House and the Senate have associated with them is how we'll make sure this is a global endeavor. Do you anticipate ending up at the World Trade Organization (WTO) over these types of carbon offset discrepancies? I don't think there's any question there'll be a WTO challenge here. One of the things that the [climate] bills in the House and the Senate have associated with them is how we'll make sure this is a global endeavor. And although China seems to be moving in the right direction, and other major countries are as well, we have yet to hear from India, a very competitive manufacturing base for the world, and for American manufacturers in particular. The concept moving its way through the legislative process in the House and the Senate is that if you create a ton of steel in India and it has a carbon footprint of 4 tons of carbon, and you create a ton of steel in the United States and it has a footprint of 4 tons of carbon, you'll have to buy 4 tons of credits here. And before the steel manufacturer in India can bring that product into our states, they would have to buy 4 tons of international offsets. So you have an absolute equilibrium in the cost of that ton of steel as it pertains to the environment. We've spent a great deal of time, energy, and resources, with supposedly very smart lawyers in Washington, who tell us that this [approach] might well pass WTO compliance. It's not intended to punish anyone. It's intended to encourage them to create a program. Where does a country like China fit into this? China has got its own program, [but] it won't have to buy the credit, [and] some would argue that that's not perfectly equal on the climate side. But the encouragement here is to get every country addressing the issue. That really is the motivation. Your position on avoided deforestation is that these projects should be counted as offsets in any U.S. legislation that sets conditions for a mandatory carbon market. Do you see this avoided-deforestation inclusion as possibly creating a collision course with the way the rest of the world, particularly Europe, is operating? If avoided deforestation is a credit-worthy activity -- defined, again, by the Environmental Protection Agency or some governmental agency -- then we'll buy those credits and take full advantage of them. No. The European Union doesn't believe that avoided deforestation ought to be a credit mechanism; and if you're a utility operating in the European Union, it won't be a credit that counts against your requirements. While in America, if avoided deforestation is a credit-worthy activity -- defined, again, by the Environmental Protection Agency or some governmental agency -- then we'll buy those credits and take full advantage of them. It appears that current proposed climate legislation could open a new market for 2 billion offsets. I know that you and some of your colleagues from other companies sent a letter to Senators Kerry, Boxer, and Lieberman, asking that the definition of the use of forests not be changed. Tell me what you were concerned about. Actually Kerry, Graham, and Lieberman are the three who are now working on what we (at least, hear) is [legislation] the Senate is trying to coalesce around. The Kerry-Boxer [climate bill] has [the forest-offset provision] in there and has it right. Senator Kerry is a very strong proponent of this undertaking. I've shared a podium with both him and his wife on this issue. They feel very dedicated to the issue. Clearly the Waxman-Markey [bill] had the same approach. What we're saying is that you three senators, as you bring together this bipartisan coalition that may get something done in the U.S. Senate, let's not leave this [provision] on the edit-room floor. This is too important. I think everyone understands, although the numbers are bouncing around some, that deforestation accounts for between 15 and 20 percent of the world's carbon footprint. So avoided deforestation -- almost like energy efficiency, I would argue -- is one of the supposed low-hanging fruits. But, it needs to be honest. It needs to be transparent. It needs to be verifiable. And it needs to be respectful. And that's really what the Unity Agreement was all about. This can't just be America going down to Indonesia and saying, we're going to buy this land, and all of you people move out of here, and see you later: We're going to manage and take care of it from here. That's not what this is about. This is about being respectful of those who are there; being respectful of the historic owners of the land; being respectful of how you react to the wildlife, particularly in a tropical forest, where there's just an incredible amount of biodiversity. All of those things are critically important. And it can be managed and should be managed. Some of the criticisms of the AEP forest project in Bolivia and some of the criticisms that we heard in Brazil -- in this case, from people with the forestry division in Parana State and, at the national level, from people negotiating climate change -- was that it was difficult to create a reliable credit in this kind of setting. There was a great deal of concern about leakage and the permanence of creating an offset out of a living organism that is subject to disease and fire. The early conversations [about reducing emissions] by 40-50 percent by 2020 -- you can make any comment you like, but when that doesn't happen... you're going to move on to a more realistic number, like the 17 percent the House came up with. Oh, heavens no! I think there was a tremendous amount of learning. You know, these were early projects. In fact, they were done under the joint early initiative back in the 1990s. I know the '90s to some sounds like not so long ago, but when you think of the technological advancements between 1996 and 2009, [they are] pretty substantial. No. I think all of those criticisms were probably fair. They may have been a bit more emotional than they needed to be, but we've learned a great deal since that time. Are you talking about the Noel Kempff avoided-deforestation project you financed in Bolivia, which has come in for a lot of criticism? When you think of Noel Kempff -- particularly, the early calculated numbers, which were not calculated by us, but by outsiders -- [it's that] there was a tremendous amount of carbon sink that was going to be created there. That figure is almost a factor of 10 less today because the technology of how we go about calculating the impact is considerably different. They were verified numbers then -- and, again, not done by us but by others -- and they are verified numbers now. . . . We've learned from what happened in Bolivia and other places, and we'll carry that learning forward. You spoke clearly about the idea of transparency. What was the biggest lesson learned from being down in Brazil? Have you been down to these forests? No I've not. So I would argue that the biggest lesson to be learned, really they're probably three-fold. One that the early estimate clearly way beyond the capacity of what the carbon sink was. Again, other [estimates] done at the time using the equations that botanists said made sense, but what we're finding out after the fact is that [it] clearly wasn't there. I would imagine, and again I wasn't there in the early go, but I would imagine that we came in as American companies frequently do. Everybody get out of the way, we're going to do this. That's not a way to be accepted by those who are affected by it. So I would imagine we learned a great deal through that endeavor as well. Lastly, I think that we all have learned a great deal about what is the footprint and how do you prevent the leakage that would go on. And I think those are all important lessons. And, again, our effort will be never to repeat those endeavors but to go in as a willing partner and participant after conversations with the local folks and the governmental folks involved to make certain that there's agreement with what we're doing. To do it with partners as well. There's no reason to be a lone ranger in one of these endeavors and then to invite whomever into the question to evaluate this. I had this very interesting give and take with Karl Pope of the Sierra Club on carbon capture and storage and we were arguing politely, and I hope respectfully, that we thought that made a lot of sense because it was an effective way to go about doing it. And he said, Why not just shut your coal plants down? And I said, Well, that would be an easy answer if I didn't have to keep the lights on where we do business. You know, these are very honest approaches to take. I respect people's opinions. I hope they respect ours. We all have at the end of the day, the same goal. We really do. It's how we get there, how quickly we get there, how cost effectively we get there. And we'll try not to repeat them. I always tell the team, we're bound to make mistakes. We can sit back and do nothing and create no errors, but if we actually try to do something we need to learn from that and correct them as we go. So guilty as charged if that makes everybody comfortable. Repeated? No. We won't repeat them. To the point that you said earlier that others were mistreated. Sure. Your company has spent a substantial amount of money lobbying in Washington on the climate legislation. What is it that you wanted from that legislation? Why spend so much money? Here's what we wanted. We wanted to make a difference. We wanted to address the issue. And we wanted to make sure we had some reasonableness built into the program. And I would argue that through the hard, hard work of Henry Waxman and Ed Markey and others on the committee -- Rick Boucher in particular, who is a congressman from Virginia and a customer of ours in coal country -- I would argue we got there. There was a great deal of logic behind what went into that. I was always looking to come up with timelines that I felt were reasonable in a technology development sense, and early [emissions] reductions that made sense. The early conversations [about reducing emissions] by 40-50 percent by 2020 -- you can make any comment you like, but when that doesn't happen, what are we gong to do? We're going to go on to some other, more realistic number, like the 17 percent the House came up with. I wish it were less than that, but I made a commitment to the NGOs that I'd never bring that up again; so 17 percent is what we've got. The Senate went to 20. I think that's ill thought through. I would hope that they come back to 17 percent. Some are arguing for 14 percent. Not me. The deal we made was 17 percent. I'm fine with that. So that's what we were always after. And why? Because 5.2 million people look to this company to supply them with reliable, affordable electricity -- now and in the future. We've done it for 102 years. I hope we do it for 102 more. The California legislature decided that we'd have no more internal combustion engines in this great state by this day. I came here in an internal combustion engine car. I'm sure you did, too. So my argument all along is let's do something we can accomplish. Back to negotiating a workable climate policy, how would you define "reasonable?" Well, it was important to get the timelines matched up with the technology. As I mentioned earlier, I'm probably a bit more aggressive than my colleagues, in that I think carbon capture and storage in a retrofit application will be deployable by mid-decade. Some of them think it will be 2020 or 2025. I think that's a bit pessimistic. So if you were aiming to have a 20 percent reduction of your '05 footprint by 2012, it wouldn't have happened. Early on, when the White House talked about auctioning off the credits, we said, "If you want to have a carbon tax, let's have that debate." We had that in the Clinton administration. We can have that in the Obama administration, and do it again. There is no environmental benefit whatsoever from a tax. None. I argue every day with my colleagues in the business world -- the fellows from Exxon Mobile, the fellows from Federal Express -- a number of them argue mightily for a tax. I don't think that changes the environmental footprint. That's what we're after, asking for a difference. So that's what I meant by "reasonable." We are here in California today. Some years ago, the California legislature decided that we'd have no more internal combustion engines in this great state by this day. I came here in an internal combustion engine car. I'm sure you did, too. So my argument all along is let's do something we can accomplish and let's let America lead the world. We have a chance here to do something really unique, and I think we should. I really do. And that's what we were always after. What is your motivation to be part of this movement and get into this carbon market? I think senator McCain may have said it best back when he was a strong proponent of the McCain-Lieberman [climate initiative in 2003], and that was, "Look, you can set aside the issue of whether or not you believe the science or not, [but] if we do this and the science was wrong, we've only made the world better. If we don't do it and the science is absolutely correct, then we've got a nightmare on our hands" and, again, a company like AEP -- and I borrow this phraseology from David Ratcliffe at Southern Company -- really is part of our DNA to continue to force technology forward. It will benefit our customers. It will benefit our shareholders, and it'll benefit our company, our country, and the world, I would argue. I was with [Energy] Secretary Steven Chu just a few months ago in London, and he made these statements, and they're absolutely accurate. China is coal-centric. India is coal-centric. Russia is coal-centric. Indonesia is coal-centric. Much of South America and Poland are 95 percent coal based. They're going to continue to burn coal. We need to retrofit [coal]. I think one of the important comments I try to make all along is that we really went about beginning this endeavor in our country probably in the 1970s. Over the last four decades -- the '70s, the '80s, and the '90s and now in the 2000s -- electricity consumption has gone up. Coal generation has gone up, and the air is getting better. If we have this technology, we should bring it to the fore. And that really is part of the driver of what we're trying to do here. Remember, because we're regulated in every jurisdiction where we do business, each and every one of these dollars expended ultimately will be recovered from our customer. What was the intention of getting into the game so early? It's almost identical to what's motivating us to do the carbon capture and storage undertaking in West Virginia. The reality is, the earlier you try these things, the more you learn from them and the less likely you are to make missteps going forward. Remember, because we're regulated in every jurisdiction where we do business, each and every one of these dollars expended ultimately will be recovered from our customer. We need to do that with a great deal of respect for the impact that it'll have on them and the economies that we serve. Early on, deforestation was really never intended to create a carbon credit 10 or 15 years down the road. We think there ought to be credits for early action. At the same time, we were just trying to do what we thought made sense as an environmental undertaking. Our company in particular was among the most prolific fighters of the Clean Air Act. We're a different company today, and I respect those who led this organization. In 2008, we did this college campus tour all across the country, [visiting] a lot of technological universities. It was eye opening to hear what the students on today's campuses had to say. Many of them, angered, said, "Why are you even here? Are you trying to win some plaudits or credits?" By the time we were done, I think they all walked away saying, "These people are real about what they're trying to do here." What do you say to those students with respect to forests, where you're using forests to offset emissions because it's so much cheaper than building renewable energy alternatives on a major scale? My answer to that would be "You bet!" Because that's what I'm required to do in the 11 states where I do business. I'm required to [provide energy] as cost effectively as I can. We're doing renewables. We're doing wind. We're doing sun. We're doing all of those things. We've been in the hydro business for 102 years. We're a nuclear-power producer. But we're doing this in the most cost-effective way we can. I think it's incumbent upon us to do that, to protect our customers. So, in fact, I think that question was asked, and I said just that: "You bet I am." The European Union has developed considerably more wind [energy] than we have in the United States. Not necessarily as a resource base. Why? They give a $50 per megawatt credit. 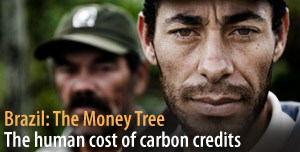 We give a $20 megawatt credit. I had this very interesting give-and-take with Carl Pope of the Sierra Club on carbon capture and storage. We were arguing politely, and I hope respectfully, and he suggested, "Why not just shut your coal plants down?" And I said, "Well, that would be an easy answer if I didn't have to keep the lights on where we do business." You know, these are very honest approaches to take. I respect people's opinions. I hope they respect ours. We all have, at the end of the day, the same goal. It's how quickly and cost effectively we can get there. But we all want to keep the lights on. And we all want to make the environment better. If you were sitting in a room with European climate negotiators to hammer out a global deal, and the guy across the table says, "We have to have a linked global carbon market, and everything sounds fine except this darn thing called avoided deforestation." What are you going to say to that person? I'd try to meet them on a compromise, and here's the foundation of that. If you're concerned about the viability of the original definition, we can agree that satellite technology will tell us exactly what the footprint is. If you're concerned about the size of the carbon sink, let's have your botanist and your plant technologist get together with ours, and we'll work that out and come to some logical conclusion. If you're worried about leakage, let's go about it in a different way. ... Say, we thought the credits in year six would be -- pick a number --say 5 million tons, but there's an uncontrolled fire and impact from that. Then that year maybe I've a loss in credits rather than a gain in credits. Address it that way. There are ways to go about finding a middle ground that makes sense. And, again, there's so much history here. The European Union has developed considerably more wind [energy] than we have in the United States. Not necessarily as a resource base. Why? They give a $50 per megawatt credit. We give a $20 megawatt credit. If you talk to wind developers anywhere in the world . . . we went to the European Union first because in the United States we were offering $20 for only two years at a time. Over there, they were doing $50 over a horizon. So the world has always gone about this in a very different way. Just as we won't tell them to run around in big Hummers, they ought not tell us to run around in small Fiats. I find Morris' positions self fulfilling. He appears to be totally oblivious or does not want to admit that India as a country is more actively pursuing greener projects than what his company (the worst CO2 emitter in the western hemisphere) is committed to. To put things in context, the whole of India generates approximately 130,000 MW of power to meet the needs of its 1.1 BILLION population AND the industrial needs. Compare this to about 39,000 MW of power that Morris' company ALONE generates to serve ONLY 5 million people and its industrial base in 11 states. His company's generation is about 30% of the ENTIRE country of India. He needs to get real. He will not have luck in his drive to put tariffs on products imported from other countries and expect the US population to buy "expensive" products made in the US. Looks like his company operates in a regulated environment and his growth strategy for the company is keyed to recovering costs through the rate base. I see ALL his posturing as a smokescreen to later justify his basis for cost recovery for more expensive power. He should cut his ties with the coal mining, railroad and other coal related companies and be committed to reducing his company's CO2 footprint and be a more responsible Corporate Citizen.